…is the name of one of the over 40 llama owned by the West family. Heart Beat was the third best female llama at Grand Nationals in 2006. This is a red wine blend of 2007 Cabernet Franc and 2007 Merlot. These wines have aged for 18 months in a combination of new American oak, new Hungarian oak and used French oak barrels from different forests in France and from different vintages all of which create some unique coffee and chocolate flavors and nose. This is an off dry blend with 1% residual sugar added to produce an easy sipping wine that pairs well with meat loaf, beef stew, pasta dishes, and Italian foods, but is also excellent for just sipping on the porch. …the history of Merlot can be traced back to the first century in France. These grapes are large and thin skinned, which makes them vulnerable to birds. The history of Merlot is dotted with stories of crops being destroyed by flocks of hungry birds. The most famous home of Merlot is the Bordeaux region in France. Our Merlot was fermented for 18 months in a combination of various used French oak barrels, new American oak and new Hungarian oak barrels. The wine is made from 100% Merlot grapes and is also used in the In a Heartbeat red blend. It is a full bodied dry red with tastes of pepper and flavors of plum, chocolate, vanilla and leather. Merlot pairs well with steaks, pasta dishes such as lasagna or stuffed shells and even chocolate. …named after one of the female llama on the farm and fondly called the "female companion of Merlot". Merlina combines about 95% Merlot with 5% blackberry juice. A little bit of sweetness balances the tartness and fruit forwardness of the blackberry. It has quickly become a visitor favorite. …This elegant white is made from a blend of our Chardonel aged in oak and our Traminette aged in stainless with just a touch of sweetness. It carries aromas of orange blossom and honeysuckle and flavors of tropical fruit, apricot, grapefruit, pear with a long lingering finish. …is a hybrid white grape of more recent origin, which was released by Cornell University in 1996. It is a cross between Joannes Seyve and Gewurtraminer. The wine produced is distinctively spicy and fragrant with floral aromas and has some characteristics of German wines. Flavors of lemon, grapefruit and citrus are often identifiable. The wine is finished semi-dry, with about 2% residual sugar to balance the acid and flavor in the palette with the initial distinctive aromatic experience. The result is a crisp, balanced wine which pairs well with spicy foods such as Thai or other Asian dishes. The wine is fermented in stainless steel tanks with no oak. …is made with 100% Traminette grape varietal. Traminette Gold is finished dry in stainless steel tanks. It still has the floral aromas of our regular Traminette. Very floral and fruity with a hint of spice. …is a hybrid white grape and was the result of a cross between Seyval and Chardonnay in 1953 in Geneva, NY. It is a late ripening grape and has a bit higher productivity and more cold hardiness than Chardonnay. Not as tart as a Chardonnay. Aged in stainless it has notes of banana, and clove with mouthwatering acidity. …This 100% Chardonel is produced in seasoned (used) oak barrels and recouped oak barrels and has a slightly buttery and vanilla sensation. It has an elegant and creamy mouth texture. Only a few other vineyards in North Carolina offer a varietal Chardonel wine. 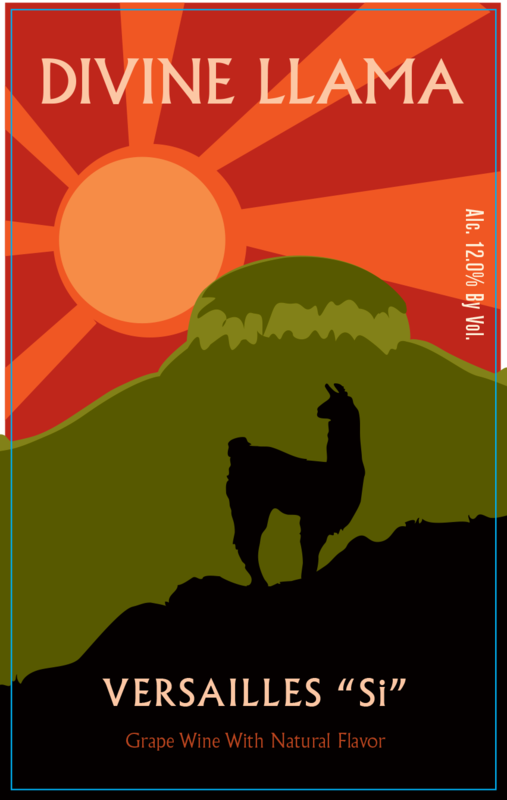 …named after the West's youngest daughter's show llama, Si is the newest wine made by Divine Llama Vineyards. A blend of 90% TRAMINETTE and 10% peach juice to compliment the floral TRAMINETTE aromas. 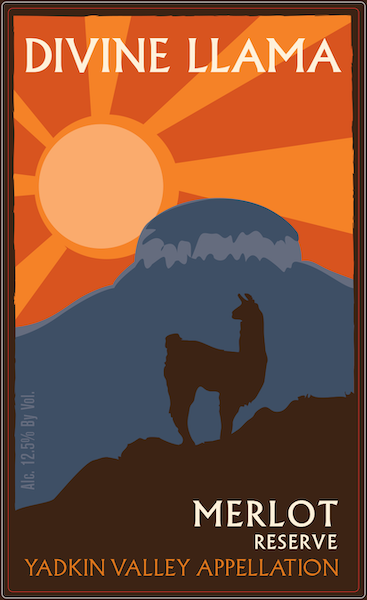 …is named for the llama herd matriarch. The rose wine generally made differently every year but always contains some Cabernet Franc, two to three white varietals and a more sweetness than our other wines. It almost always presents a fruity strawberry aroma, and sometimes flavors of mandarin oranges. It provides a light crisp wine which pairs well with desserts. The white grapes are finished in stainless steel and the Cabernet Franc is made in used French oak barrels, so there is a subtle effect of the oak on the palette.